Teaching with WordPress: Sensei, WP Courseware or Premise? @chrislema if I want to sell m/ships to my website, what is the best solution? WooCommerce and Groups? PMP? Premise? Wait, Membership or Online Course? The first nuance to my answer (“it depends”) is whether Troy wants to just sell memberships or run actual courses. If he just wants to sell a membership – then using Paid Memberships Pro or Restrict Content Pro would be my answer. PMP is free, fast to configure, and has gateways for Stripe, Paypal, and Authorize.net. But you can’t really participate in two memberships at once. And that could be an issue. RCP, on the other hand, doesn’t have that issue, and while it has a cost – it’s not much. Either way, just pick one, and set it up , and you’re on your way. But if you’re offering a membership so that you can offer courses, then you’re going to want to keep reading. None of these is going to give you a serious test infrastructure. None of these is going to give you an amazing gradebook. Which means, I wouldn’t run a university using these (if I had one). So with that out of the way, we can call this a great solution for experts, gurus, trainers, and coaches. Cut to the Chase – What’s the Best for Teaching with WordPress? What kind of course experience are you trying to deliver? Will you be giving quizzes? How will they be used? How much revenue are you ‘protecting’? Let’s see how they line up…. 1. WordPress, WooCommerce & Sensei – The experience here is something the guys at WooThemes spent a lot of time on. That much is really clear. In the latest update, they even added some configuration settings to make the experience even better. Users shop, using Woocommerce, and buy products that are linked to courses (on the backend). This gives them the right to enjoy the course (assuming they’re logged in). In this way, there’s really no “membership” product. Just an e-commerce solution and a course solution that is aware of the e-commerce one. Seamless is a good word for it. But be aware you’re using a massive infrastructure to deliver that experience. I love the guys at Woothemes (subscription member since 2008) and dig both Woocommerce and Sensei. But it’s a bit overwhelming to configure everything just so you can get that experience. So if you go this route, get some help. 2. WordPress & Premise – Want a similar experience without the bulk? That’s Premise. And on top of that, it offers you fantastic solutions for various landing pages. So your sales, squeeze, and conversion pages are all easy to create (something most people forget) with Premise. Your customers will land on page, continue thru to payment, and then land on a page where you’ve placed your premium content. And with their new membership features, you can protect pages, posts, and even parts of each – all just for paying members. Lightweight & Seamless is how I’d describe it. 3. WordPress, Paid Membership Pro (or Restrict Content Pro) & WP Courseware – Just the list of components makes you wonder if you should go this route. I know. But here’s the thing – the configuration happens just once. So don’t let it stop you. That said, the experience is good, but not as seamless. But it’s a very inexpensive solution (compared to Premise) and lighter-weight than WooCommerce and Sensei. Here’s how I’d define it in short form. So if all you care about is the experience, pick one, and move on. You can take off. But what if you plan to use quizzes? 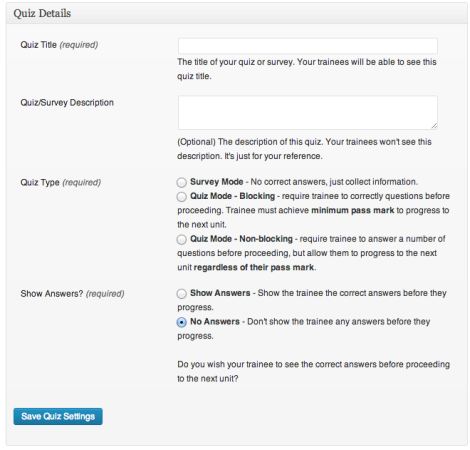 How will you use Quizzes? 1. WP Courseware – So if you were wondering why WP Courseware was in the list, after it came in third place above, you’ll quickly notice it comes in first place when it comes to quizzes. The image above shows you how many different options you get, which Sensei doesn’t deal with nearly as well and Premise doesn’t have at all. I think this is one of the two reasons why WP Courseware is my favorite. It really does a great job with quizzes and using them to limit or not limit student progress. And I’ve created courses where the quiz is there to help people but doesn’t stop them from progressing. They have it handled! 2. Sensei – Sensei has quizzes and they have the ability to change how course progress moves without worrying about quizzes. So that’s good news. But when I stated that quizes weren’t critical to the progress of a student in a course, I thought that’s all I was doing. It turns out that the dependency code (only show course 2 after course 1 is complete) is tied to quizes. So killing quizzes also kills the dependency check. Huge bummer! 3. Premise – Premise can’t be faulted for not having quizes. It was never set up to do this. In fact, with Gravity Forms rolling out a Quiz add-on soon, this may be less of an issue and you could combine the two for the perfect solution. But today, it puts Premise at the back of the line. Oh, you want this? This Revenue right here? And here’s where the rubber meets the road. Because if all you want is to let people inside the gate and let them grab all they can before they quit and ask for a refund (seriously, they do this), then you can pick from the list above and nothing will protect you. Let me spend a second highlighting this challenge. If you don’t use a sequential delivery mechanism (drip) for your content, a person could pay $500, get inside, download everything in 2 days, and then turn around and ask for a refund. Likely you won’t have anything you can do except to pay them. That’s horrible. That’s why I’m such a huge fan of dripping content. It protects your revenue – pure and simple. 1. Premise – Yes, they’re really the only solution that does it well and in an integrated way. While the others offer some form of sequential delivery, it’s often based on the passing of a module to progress to the next. They can do that in minutes. What you need is a time-based delay. Only Premise does it – putting them in first place now. 2. 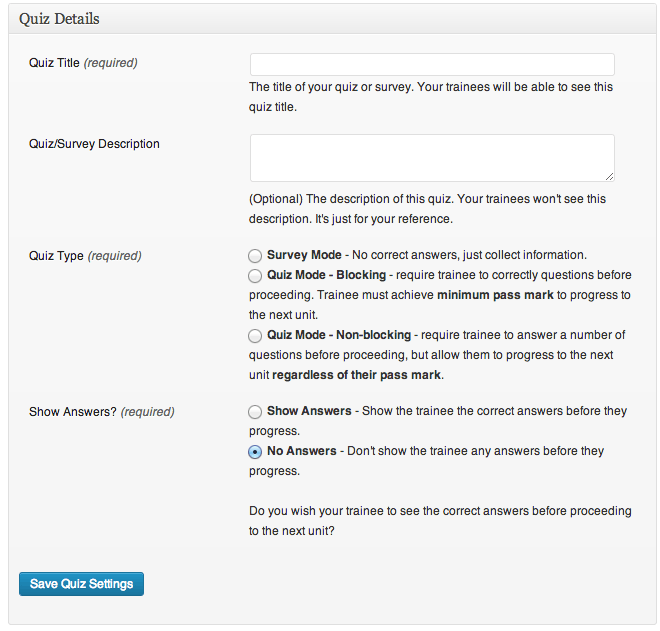 WP Courseware – As I mentioned above, when you take away quizzes, Woo’s Sensei falls apart on sequential delivery. So that puts WP Courseware in second. It can hold people back, but that’s based on passing the previous module, not waiting a certain amount of time. 3. Sensei – They don’t do it. At all. Now you see the Challenge, don’t you? If you look closely, each solution gets first place based on what you care about. So once again, the answer is really in your own hands. But trust me when I tell you that all of them are way better than what we had available to us a couple years ago. So for that you can celebrate. But now the call is up to you. Go for it. But Chris, what would you pick? I get the emails saying that my comparisons are balanced and useful but they never end with one single answer. Let me first say that I’ve bought all three and find that they’re each useful in certain circumstances. But if I had to pick one solution to use for most of the cases – today I’d pick WP Courseware.